How to Lay Sod | KaBOOM! Beautify your playspace with fresh, green grass where children can run and play! Before starting work, make sure the area is adequately prepared. Measure and mark the area to be sodded. Use flags at the corners, and lay a string line down the center along both axes. Determine the total square footage of the sire. Calculate how many square feet of sod will come on each pallet. Create a plan for the placement of sod pallets on the field so that each sod pallet can cover the area around where it is placed. Based on that plan, measure and mark the area where each pallet will go. Keep the center clear, as this is where the first row of sod will go. Place extra pallets of sod around the perimeter of the field. Ensure that during sod delivery, drivers respect your layout. Lay down the first row of sod. Follow the string line down the center of the field to make sure it's straight. Rake out the area before laying each piece of sod to loosen the top layer of soil and optimize rooting. Work outwards from the center line towards the edges. Place each piece as closely together as possible but without overlapping, and with edges staggered like bricks. If the edges begin to line up, use the utility knife to cut a piece in half and re-stagger the edges before continuing. The utility knife can also be used to cut around sprinkler heads and other objects in the field. 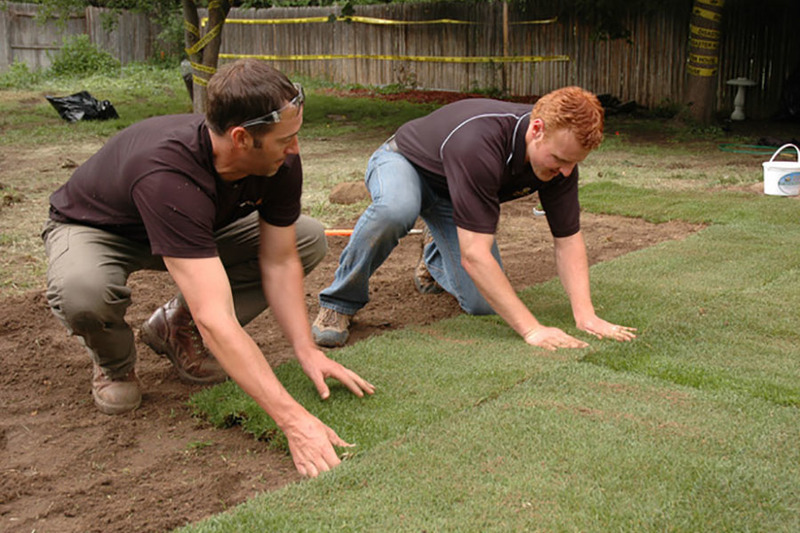 Once the majority of the sod has been laid, go over it with a sod roller. This removes air pockets and allows the roots of the sod to make firm contact with the soil underneath. Begin watering immediately. Aim to spread about an inch of water over the turf.